Fall and Winter are upon us, well for SoCal, its pretty much sunny and blue skies. In honor of the Fall/Winter solstice days. I will be drinking beer geared for colder days. Comprised of Ales, Porters and Stouts. These beers are hoppy, roaster, sweet, darker, higher abvs, low carbonation, complex spices and a faster brewing process. These beers origins are found near the seafaring ports of northern Europe and associated with the working class folk. Anchor Brewing has been a long time player in the craft beer business and was founded in San Fransico during the Gold Rush era. 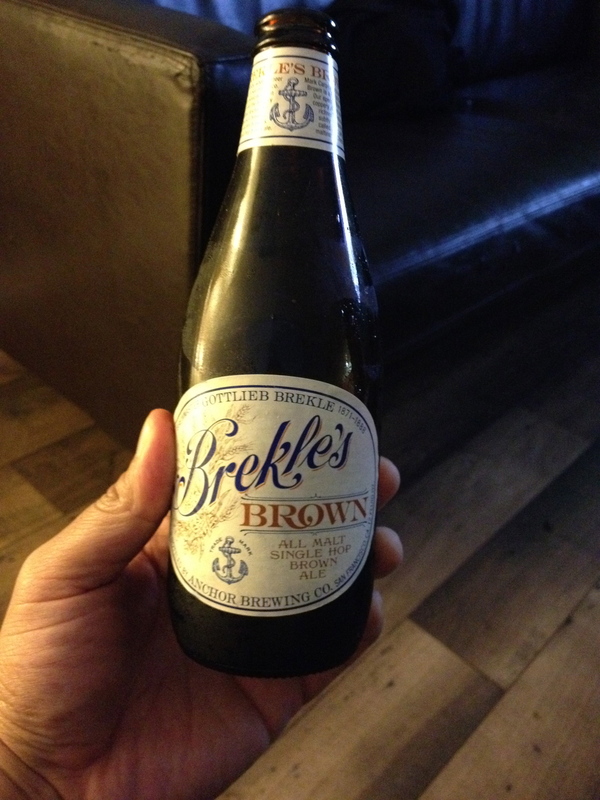 Anchor is one of my favorite beers, Brekle’s Brown Ale is a recent masterpiece recipe. Now, the only Brown Ales I have guzzled was the world famous NewCastle Brown Ale. So, when I saw the Brekle’s on shelf at my local liquor store, curiosity struck and I had to grab it. This beer was delicious and was totally surprised! It had a light roast taste, it did not taste heavy and had a Coca-cola brown appearance.The aroma was complex, you can smell different spices and ingredients and very sweet. Not too hoppy and not so bitter. The ABV 6% – after a long work week, and 4 bottles down the hatch, the Beastie Boys “Check your Head” album spinning in the background and my Star Wars history book on hand, the ambiance was set and I checked out! ~ by Golden Foam Notes on October 27, 2013.